Planes parked in the bay; one can cycle down the runway! The badge of a “cyclist” was earned in 2012 when I completed the epic Manali – Leh – Khardung La journey of 525 kms. The landscape and the voyage by a bicycle were so inspiring and life changing that the explorer spirit in me has been in a state of restlessness since then. Visions of cycling across the silk route, the Mongolian steppes, the beautiful Alaskan landscape, and the salt plains of Bolivia filled my mind. I would scour editions of leading travel and adventure magazines and bicycling books and blogs from around the world, searching for the next epic journey. With a demanding corporate career and long breaks a distant dream, I sought shorter mountain biking adventures in the Himalayas and the Western Ghats. The opportunity to embark on a dream journey, sprung in my mind, while planning a trip to the US for my daughter’s graduation. The great Alaskan landscape with its majestic snow capped mountains, mighty glaciers and glistening lakes, alpine forests beckoned through large pictorials and spreads in magazines, and I chose to embark on another journey of a lifetime. 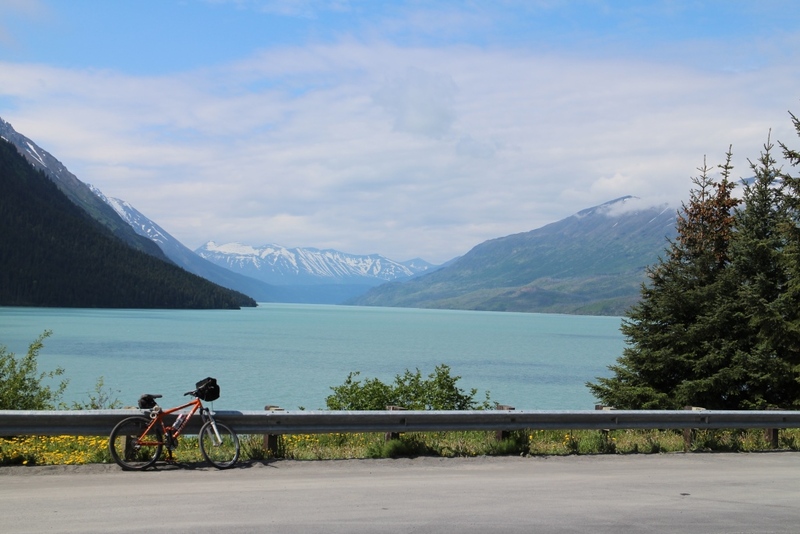 While planning, I explored many routes and highways to bike on in Alaska, including the famous Denali Highway which is still largely a gravel road. 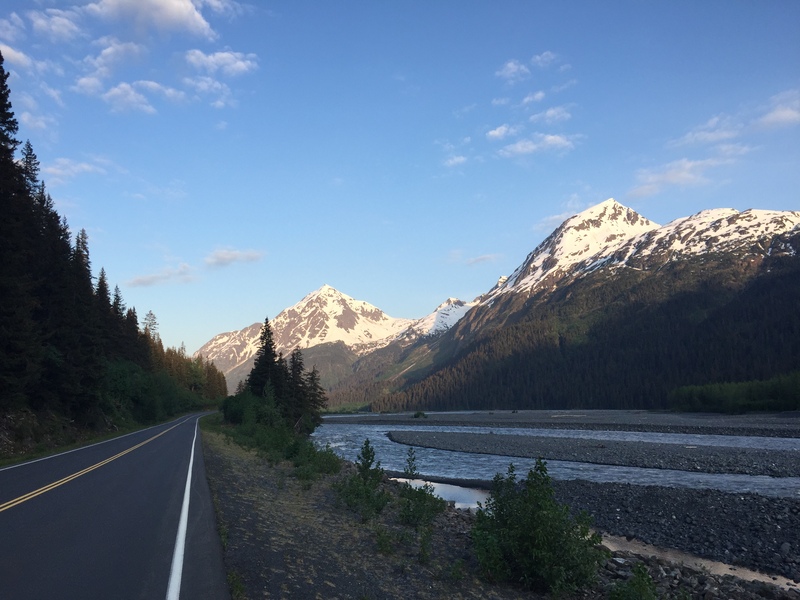 But with only a few days to spend in Alaska, I chose the scenic road from Anchorage to Seward, also called an All American Highway because of its jawdropping beauty. The Seward Highway or Alaska Highway 1 runs for 200 kms through spectacular scenery from Seward to Anchorage, the commercial capital of Alaska. Seward at the Kenai Peninsula, became the gateway to Alaska in the 1700s with Russian explorers navigating the area for gold and fur and trading with the native tribes at the time. Following the same early routes used by the native Tanaina Indians, the Seward Highway was evolved. 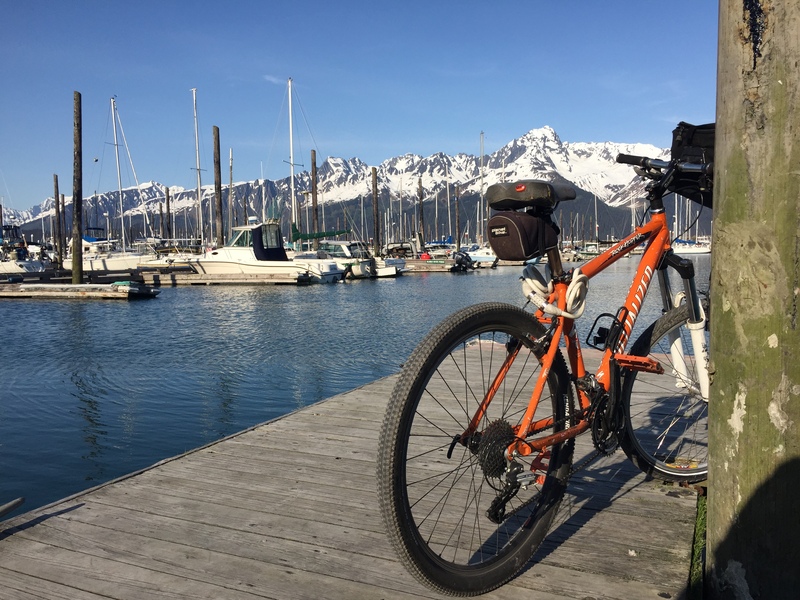 Many calls to local bike shops later, and after studying routes, weather and wind patterns, I chose to cycle northwards from Seward harbor to Anchorage as I would have the winds from the North Pacific Ocean providing some tailwind. 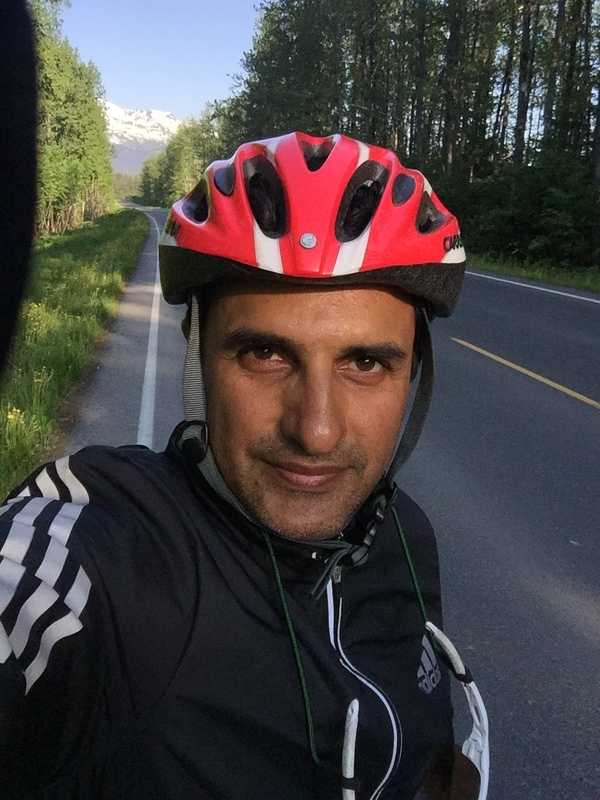 I also chose to ride on the highway as I was largely unfamiliar with the terrain and the weather was unpredictable with rain and snowstorms not uncommon in this part of the world, even in summer. 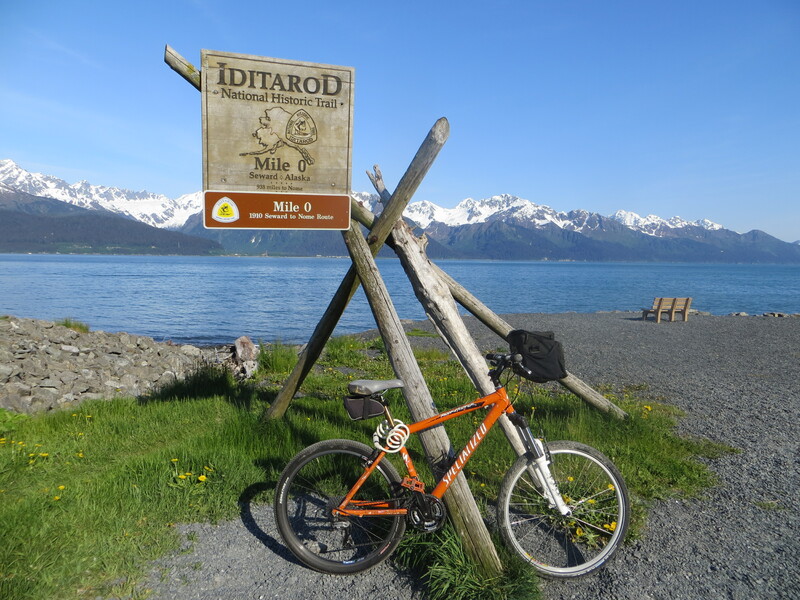 This implied that I would have to rent a bike at Anchorage and transport it to Seward. I rented the bike from downtown Anchorage and Peter the owner was very helpful and spent a long time finding the right bike from the scores he had in his shop. 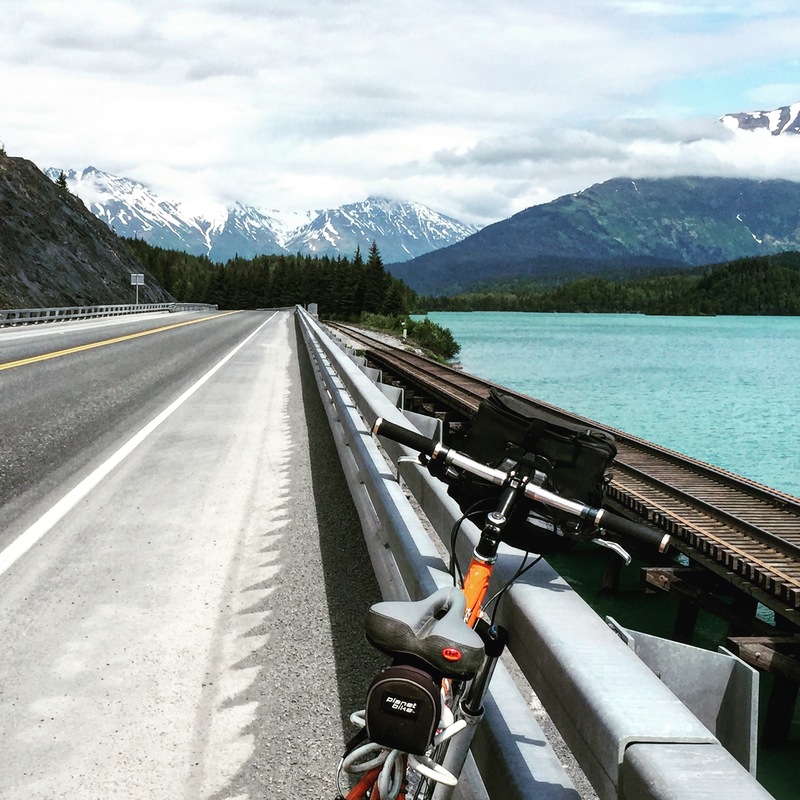 To ride, the most interesting option was to take a journey with the bicycle with the famous Alaskan Railroad. Built over many years starting from 1903, the historical Alaskan Railroad runs for 760 kms to the remotest parts of the state. Loading the bike on the train, was easy as a breeze, and I did not even have to pay the $20 charge as the railroad worker waved me off with a smile. I took a seat in a coach with a glass roof top and thus began one of the most enduring and scenic journeys on a beautiful day through alpine passes, placid lakes, towering mountains and glaciers. The train thundered over ice fed rivers, swamps with Canadian ducks and chugged past lakes with float planes parked in the waters. At precisely 11 am, the train rolled into Seward, a harbor town of 3000 inhabitants. 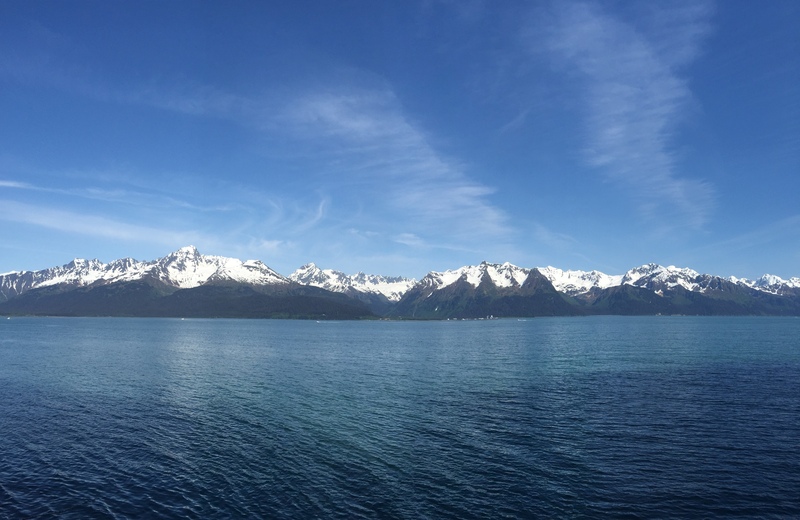 On its left flank lay the Resurrection Bay ( where the opening scene of The Hunt for Red October was shot) with the mountains of the Kenai Peninsula providing a breathtaking view in the background. In the harbor, over a 100 boats were moored. Perfect. Soon, I was on my bike with my cycling backpack and on the way to the hotel, my base from where I planned to explore the area . Over the next two days I explored the town with its charming souvenir shops, the town museum, the airport with its biplanes and the harbor. On the second day, with almost 24 hour daylight, I chose to cycle to Exit Glacier 20 kms from the town very late in the evening, It was twilight already but it would probably be the only time to get to an arms length of a glacier on this trip, so I pushed myself to just get moving. The smooth road to Exit Glacier is through the Kenai Fjords National Park, and unsurprisingly was a lonely one with no traffic and the total silence was at times, unnerving. Alpine trees stood like sentries on both sides . The sun was low on the horizon and the play of soft golden light on the Resurrection river, meandering along the road, was mesmerising. Ahead of me the road was a long winding one, even the birds seem to have gone to sleep at this late evening hour, though there was still daylight. Further ahead, the road suddenly ended and I had to take my bike up a well marked trail to the Glacier. At some point, it proved to be too narrow and I had to chain the bike to a tree and trudge through thick undergrowth to the point at which the glacier could be accessed. Exit Glacier proved to be enormous and blue, because of the light passing through thousands of minutely packed air bubbles in the ice. Its name is derived from the Harding Glacier which covers 300 sq miles of the Kenai Peninsula and is the largest icefield in the United States. 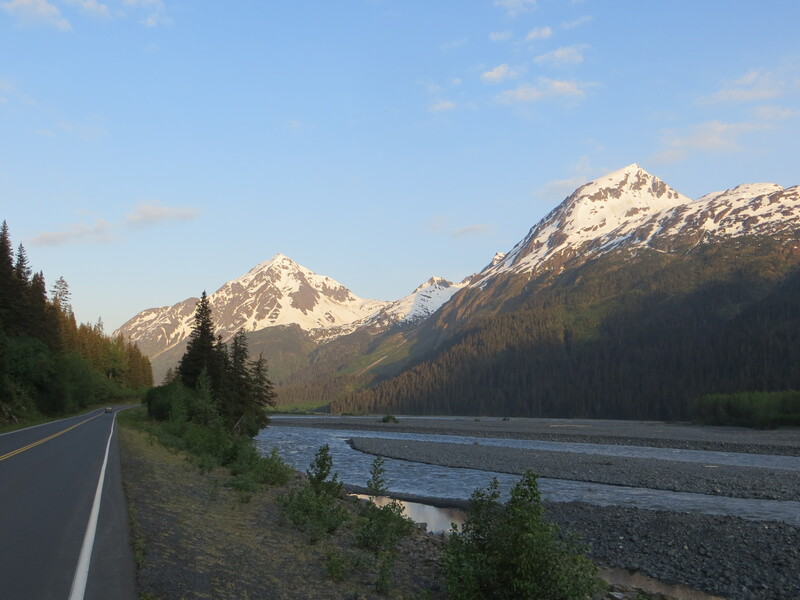 With the Glacier visit, under my belt, it was back to riding down the national park road back to the highway and Seward. 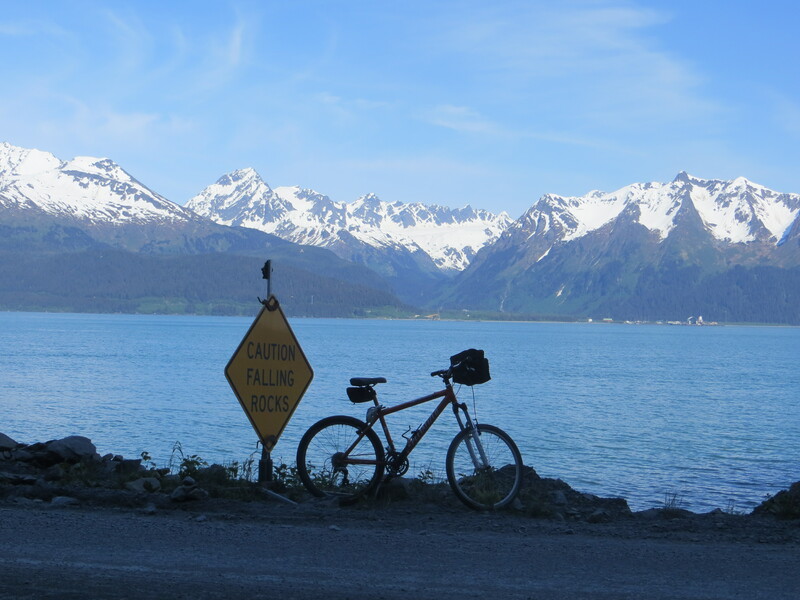 It was almost 11 pm by the time, I got back to my charming hotel and I had to begin packing for my cycling journey to Anchorage the following morning at 8 am. I woke up the next day to an overcast sky with heavy dense clouds and a drizzle. The temperature had plumetted overnight from a pleasant 18 deg C to 5 deg C. Mt Marathon’s summit was shrouded in a white blanket of cloud which seemed to indicate a possible snow shower up on the mountain. Fortunately, I was well prepared for this weather, and wore my thermal cycling clothing. But while I had a goretex jacket and shoes I hadn’t carried my rain pants. I was to regret this at some point. Strapped on was a 30L backpack which had some clothes of the last 2 days, a warm jacket, power snacks and a hydration pack. After the first 20 kms, I could feel it weighing me down. The cameras and snacks were in the handlebar carrier. 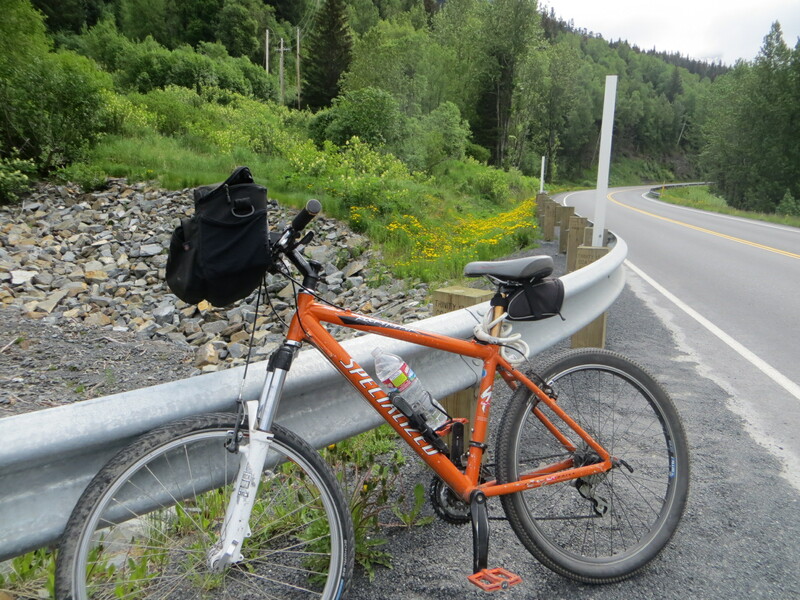 The bike I was riding was a ‘Specialised” and Peter in Anchorage had turned it into an interesting combination of mountain bike tyre in the rear and a hybrid tyre in the front. The grip was good and I pedaled ahead on Highway 1. 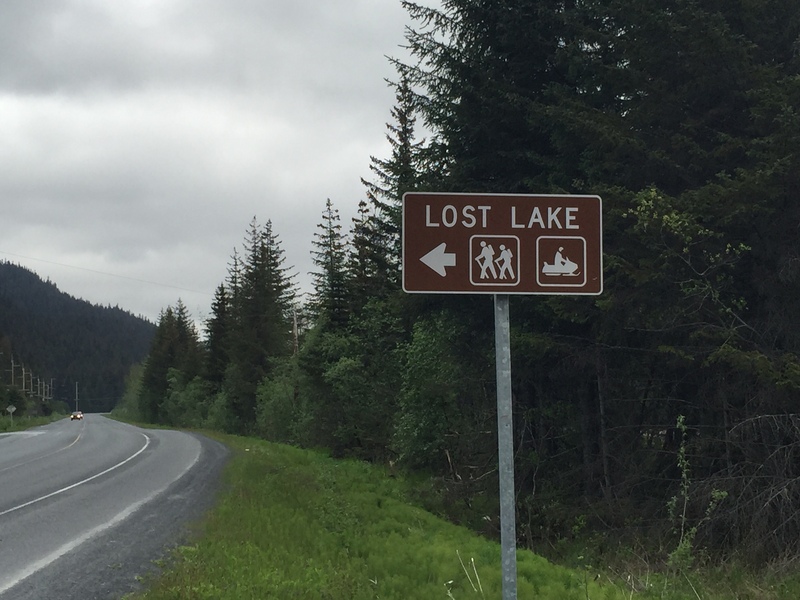 The road was apshalt and smooth, with the beautiful forested Kenai mountains cradling it. The gradient felt comfortable, but after 20 kms out of Seward, it became steeper and I found myself slipping to a lowly 10kmph. The route was now undulating, and I could feel trickles of sweat building up inspite of it being a chilly morning. The traffic on the road was light and most of it comprised of vacationing RV vans and seeing them thunder past, made me long for the day I could explore the great American highways in one of them. 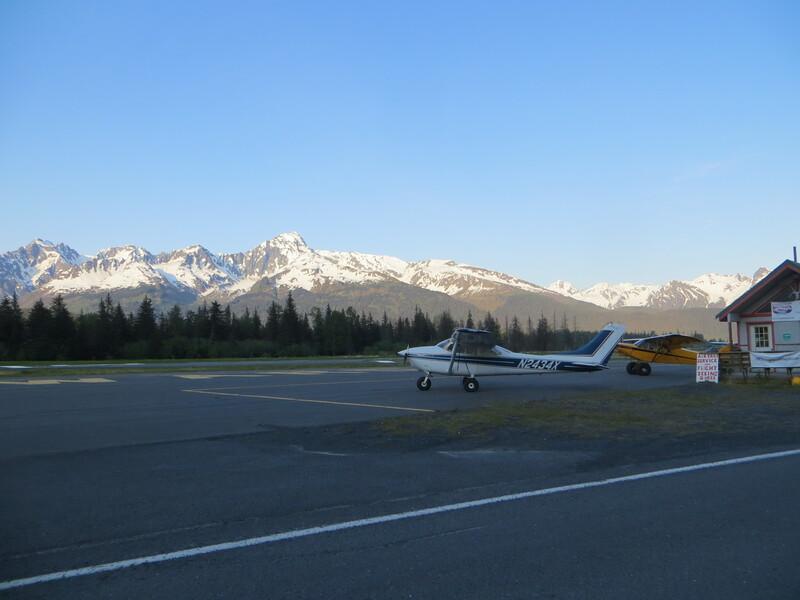 Around me, I was surrounded by alpine forests, streams, the Kenai Lake and the towering snow capped Chugach mountains. 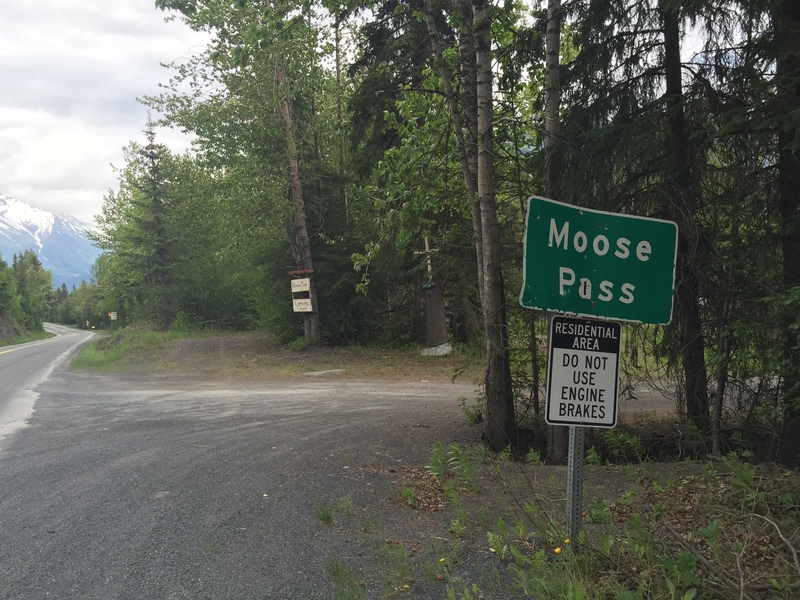 Around 3 hours later , I reached Moose Pass, the midpoint to Girdwood where I was planning to spend the night. 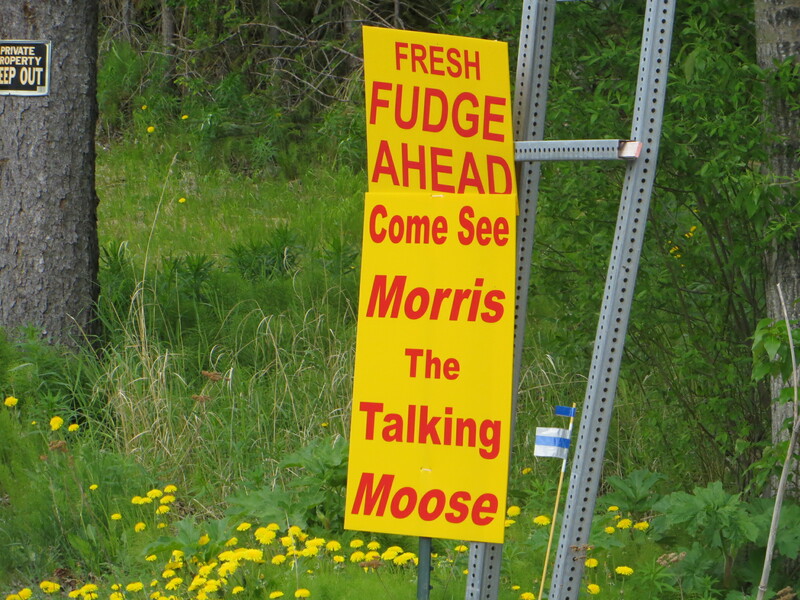 Moose Pass is a small town of 350 people, with amusing and yet warm signs inviting weary travellers like me over for brown fudge cake and tea ! Right over there on the right shoulder, was a nice looking motel and restaurant called the Trail Lake Lodge. It seemed to be the perfect place for lunch and soon enough I was gorging on some delicious grilled chicken and salad, with the wall mounted busts of bear and moose, staring down at me. What I also am amazed by is the respect they have for the armed forces. 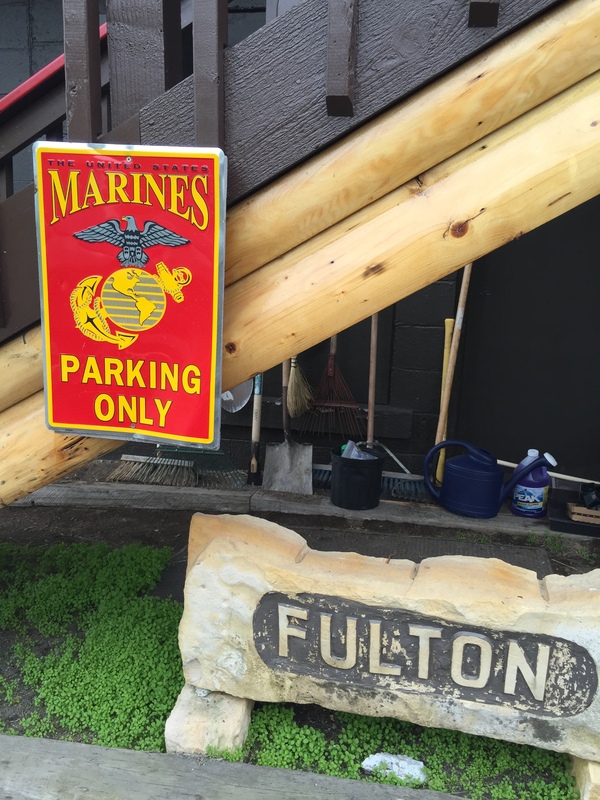 Even in this small town, there was a special parking for marines at the Lodge with the American flag fluttering proudly in the breeze. There was a good wifi signal at Moose Pass and I was able to catch up with posts and updates on Facebook and mails. Perhaps I spent too much time at the Lodge, because before I knew it, I had been there for over an hour and a half. It had been too long a rest break and I got myself cycling along at 3.30 pm. A wind had picked up and I could see thick black clouds emerging in the horizon. A drizzle smattered me for a few minutes and I was hoping I wouldn’t have to dig out my rain gear. Sure enough, two hours and another 40 kms later, I was cycling right into oncoming rain. Thick clouds swirled over the road and mountaintops and suddenly visibility was down as the rain came thundering down. I was in my rain gear by then, except for my lowers ( which I had forgotten to pack at Anchorage). With my headlamps on, and my hazard arm band on, I continued cycling through the heavy rainfall. It had turned cold and my legs were wet. My goretex shoes were covered with rain covers, but inspite of it my feet were wet too after the incessant torrent. And as often happens, the chill began to set in the body. I desperately looked for cover. There was thick undergrowth on both sides of the road, till I found, a clearing to the right. Someone had stocked timber under a plastic sheet about 100 metres from the road. That little hideout was to be my cover for the next one hour till the rain turned into a drizzle. By now it was 5.30 pm and visibility was quite low. 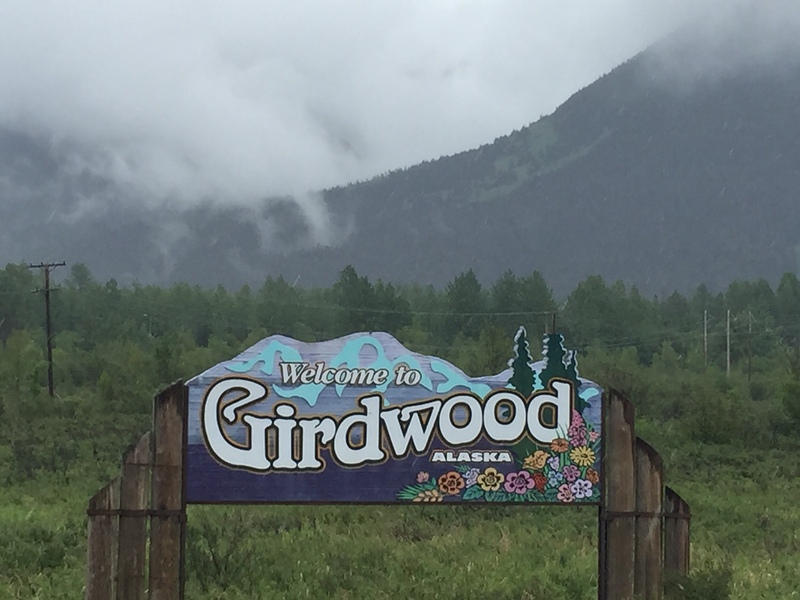 I was still 40 kms away from Girdwood and drenched from hip down to my socks. That’s when I chose to take a lift as there was no way of knowing how weather conditions would be enroute. With no camping grounds visible and lodges showing up on google maps a way out in a truck or SUV would be the only recourse. After a well earned, extragvant dining experience at the much acclaimed Seven Glaciers restaurant, and a fine red wine experience with my saviors, I proceeded to the sports and outdoor gear shop on the hotel premises to outfit myself with rain pants for the following days’ ride to Anchorage. The weather promised to be rainy and I had every intention of completing my ride into Anchorage in any weather condition! The skies were grey and dull, and a chilly wind blew scattering the early morning drizzle, the following day. Loaded and geared, I pedalled my way out of Girdwood, on a lovely tree lined cycling pathway, until I reached Highway 1. It was a busy morning with cars and trucks streaming past, releasing a spray of rainwater and dirt from the wheels. This would at most times land smack on my riding glasses and me, such that I would have to frequently stop to clean them. The rainpants were a boon because it protected me from the rain and the splash o of mud and dirt that would get sprayed by the rear and front wheels as the MTB had no mudguards. They kept me dry and I cycled on. 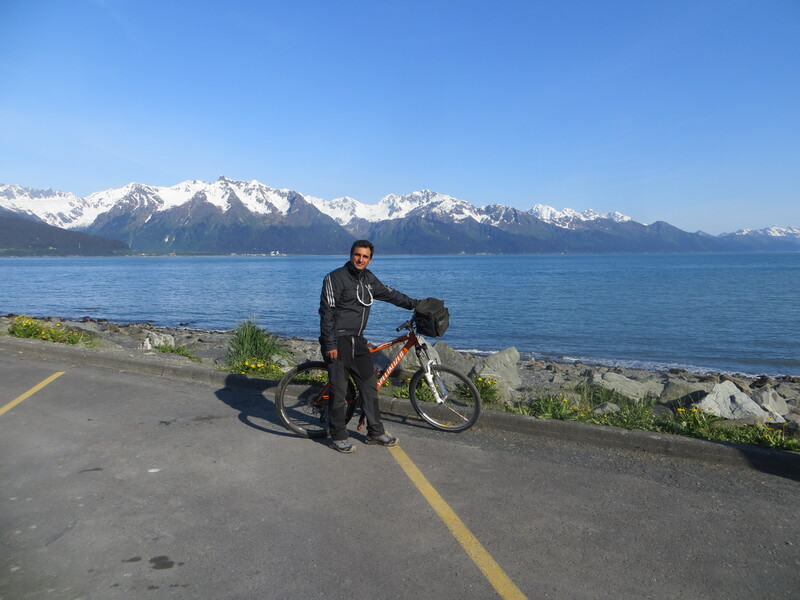 Out of Girdwood, I was now cycling along Turnagain arm. Turnagain Arm is a waterway into the northwestern part of the Gulf of Alaska. It is one of two narrow branches of Cook Inlet, the other being Knik Arm. In 1778, Captain James Cook and his crew were searching for a northwest passage to Alaska, had found an inlet which was later named the Cook Inlet. Subsequent voyages by Wlliam Blight of the famous HMS Bounty, who followed the inlet to find a northwest passage, were repeatedly frustrated when they came across a river after following an inlet. 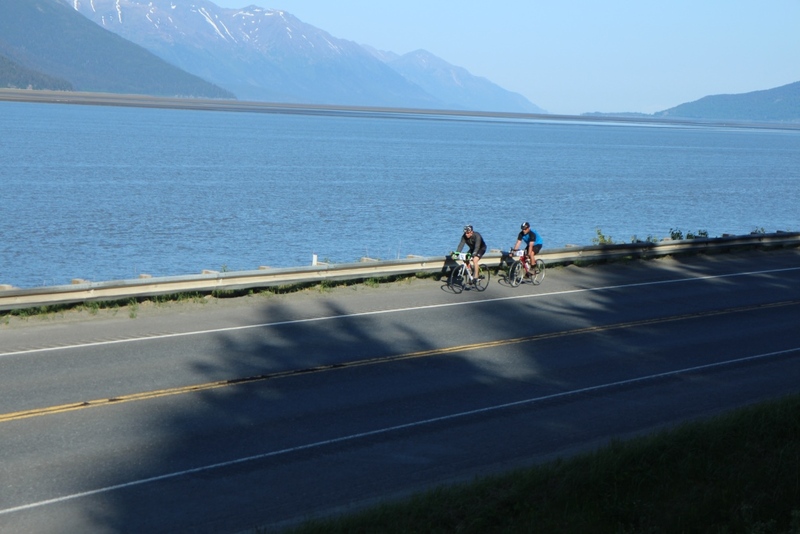 The point at which they turned around came to be called as Turnagain Arm. So, it was along this inlet, that I cycled that cold rainy morning. Across the Turnagain Arm, lay the Kenai mountains, their peaks covered with dark clouds and mist. 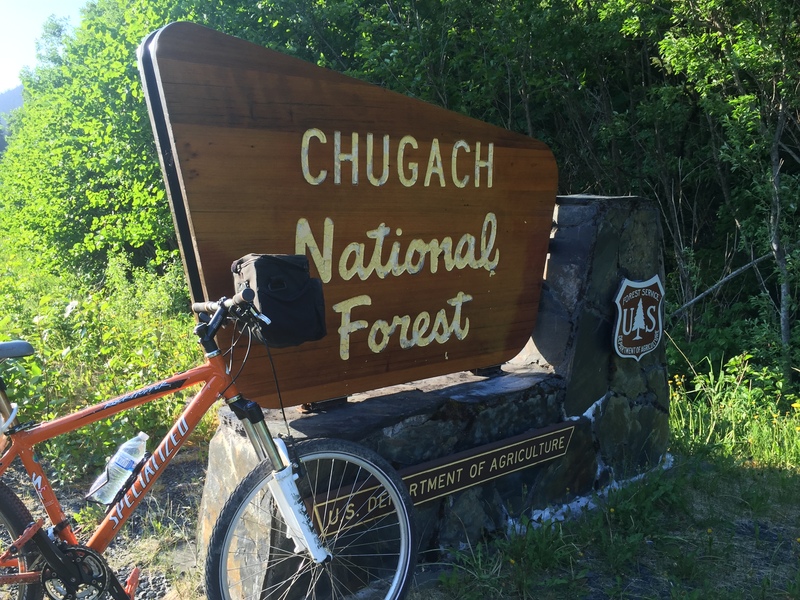 On my left , lay the Chugach State Park, densely forested with a range running for hundreds of square kms. By the roadside, grew the Tall Larkspur, a purple flower. Every few kms, I would see fallen rocks on the road and cautionary signs, making me look warily up at the rockfaces along which I was cycling. Falling rocks can be a real risk for cyclists on such roads. Short of Anchorage I came across small lakes and fresh water bodies populated by hundreds of Canada Goose, native to the temperate and arctic regions of North America. These are migratory birds and can be found as far as N Europe. It was a pretty sight indeed. 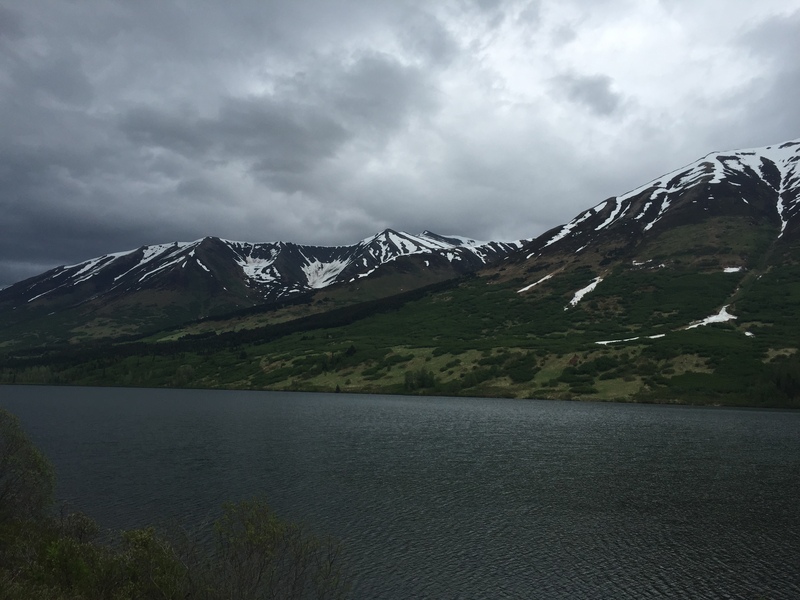 Three to four hours after leaving Girdwood, I cycled into Anchorage amidst heavy rainfall. By now, I was dripping wet and hungry and meandered through the city streets in heavy rain, using my phones’ GPS. I found refuge at a McDonalds and energised myself with a hamburgher and coke. At a nearby gas station, I bought some energy bars and jelly beans to correct my glycaemic index! I still had to figure out my way back to downtown Anchorage, and the heavy rain was not making it easier. It was at this point, when I met an old Sikh gentleman, who was driving a taxi. I greeted him in Punjabi and he was taken aback for a second, to see a man in bright colors and waddling like a penguin, speak to him in a language that he probably would have probably not expected to hear in Anchorage. He was very happy to know that I was from Delhi, as he himself was from Kirti Nagar and happily gave me very detailed instructions on how to reach my hotel. The adage that Sikhs are everywhere in the world, was proven that afternoon. I could have never imagined ever meeting one in Alaska! The 1964 earthquake in Alaska was the second most powerful earthquake recorded in history and destroyed most of suburban Anchorage. Now, Anchorage is a lovely city with many friendly people with wide avenues and great restaurants and local native souvenir shops thanks to the amazing number of tourists from other parts of the States that throng to the Last Frontier to experience the wild in the summer. That night , I stayed at a small quaint 100 year old historic hotel called the Copper Whale Inn overlooking Cook Inlet, and thereon I moved to the famous but interestingly and frequently haunted Historic Anchorage Hotel. This hotel is in the midst of the touristy downtown area, has very friendly staff to go with the friendly resident ghosts, which on last count were about 34 according to the ghostbusters that were brought in to study paranormal activity in the hotel. As urban legends go this one sure is creepy as well as there was a log book in the reception, where guests could record their first hand encounters with the friendly ghosts. And sure enough there were scores of entries going back to the 1950s with specific room numbers. I recall straining my eyes to spot my room number to try and get to know what kind of encounter to expect! 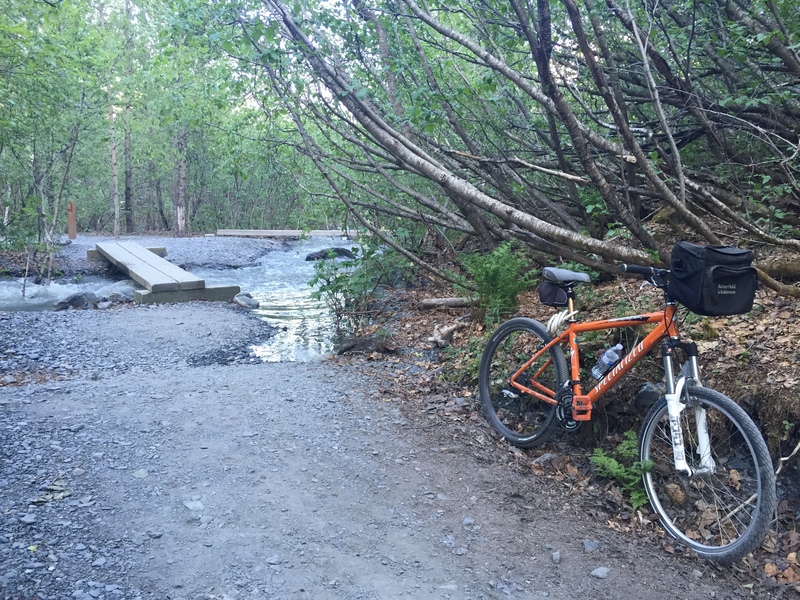 Over the next two days, I explored most of Anchorage on cycle including its museums, restaurants and its wonderful sports and outdoor stores.